Amazon Echo Spot: Last Wednesday, tech giant Amazon pushed the envelope to a whole new level in the field of home automation. Back to back, six new cutting-edge hardware (gadgets) was released in Seattle. And unanimously the showstopper was the small cute round Echo Spot. That’s the talk of the town now! So, here we are with you need to know about this new way to make your life simpler, from features to availability to prices to services…..
Echo is a small alarm clock look-alike device which will sit on your bedside and sports a camera, a small screen, and a speaker. The three which combined together have got the potential to change our lives for good. Echo is supposed to be synced to all your Alexa services, the Amazon’s intelligent personal assistant. It has been made popular by the Amazon Echo and the Amazon Echo Dot devices developed by Amazon Lab126. As quoted on the e-retailer’s website…. So yes, this adds another device to already staggering list of Alexa based devices. Echo dot, Echo Plus, Echo Buttons, Echo Connect, Echo Look, Echo Show…..my my! It seems that Amazon has taken it to point to give a tough fight against Google when it comes to the race to a perfect world of automated homes. The device, which for now is available in two colors- obviously Black and White- can easily replace your bedside clock. So, from now on your clock is not only gonna talk to you but also tell you to commute time, get the weather, show your calendar or even dim the lights for you! Connect it to a speaker through 3.5 mm stereo cable or Bluetooth and see it create magic right in your bedrooms. You can tune into your favorite track from a range of platforms including Spotify, Pandora, iHeartRadio, TuneIn and obviously Amazon Music Unlimited. And along with that you get to see a decent album art on its round screen or can even opt for a synced lyrics. Echo also gives a voice-controlled feature for a lot of your home devices. For starters, you can ask it to dim, on, off or brighten your drawing room lights or see the live feed of your baby sleeping heavenly in the nursery while you fix yourself a dinner in your kitchen. It works with smart home devices such as cameras, lights, TVs, fans, thermostats, garages, sprinklers, and more. You can go for starter kits from brands such as Ring, WeMo, Philips Hue, SmartThings, ecobee, Wink, and others. Another good thing is that it works as smartphone also as you can use it to make video calls to your loved ones and always stay connected. Also, its smart machine learning algorithm makes sure that it keeps adapting to your voice patterns, vocabulary and provide the best assistance wherever you are in your home. And when it comes to technical details of the device, this one boasts of the not too big screen at 2.5 inches encased in a round frame of 3.8” × 4.1”. As of now, its Amazon page shows that it will be available on December 19, 2017, and is priced at a meager 130$. Here is a list of all the specifications and features as shown by the official sources…..
Alexa App The Alexa App is compatible with Fire OS, Android, and iOS devices and also accessible via your web browser. Certain skills and services may require a subscription or other fees. Wi-Fi Connectivity Dual-band Wi-Fi supports 802.11 a/b/g/n (2.4 and 5 GHz) networks. Does not support connecting to ad-hoc (or peer-to-peer) Wi-Fi networks. Bluetooth Connectivity Advanced Audio Distribution Profile (A2DP) support for audio streaming from your mobile device to Echo Spot or from Echo Spot to your Bluetooth speaker. Audio/Video Remote Control Profile (AVRCP) for voice control of connected mobile devices. Hands-free voice control is not supported for Mac OS X devices. Bluetooth speakers requiring PIN codes are not supported. Audio Built-in speaker. 3.5 mm stereo audio output for use with external speakers (audio cable not included). Warranty and Service 1-year limited warranty and service included. Use of Echo Spot is subject to the terms found here. But still, the best part of the Amazon Echo Spot may also prove to be a downer. If you think a bit, as pointed out by several critics, you are simply placing a camera which faces your bed! Now, does it not conjure up some creepy thoughts regarding your privacy. Just imagine, if its control falls in wrong hands….that surely is a point to ponder upon. The dedicated digital assistant speaker went on sale for under $100 all over the world, but just for a day. It has an exclusive sale on Amazon’s regional stores like Amazon USA, Amazon India, Amazon Canada, etc. Amazon has added another smart speaker to its portfolio in India. 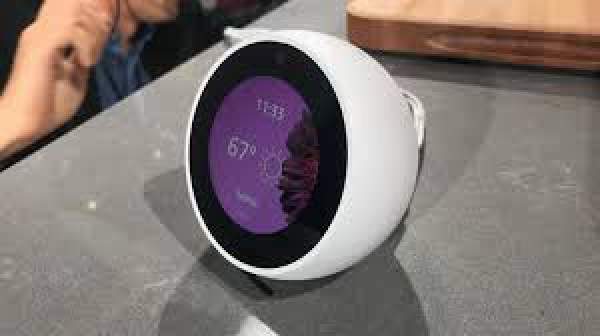 This one comes with a screen and it's famously known as the Echo Spot.